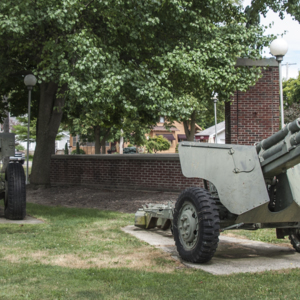 These two decommissioned field guns are permanently installed at the Veterans' Park in Woodville, Ohio. The gun to the left and further from the road was likely used in World War 1 and the gun to the right and closer to the road was likely used in World War 2, but no specific information is listed anywhere on or near the guns, and a fresh coat of paint covers the foundry numbers on the guns' barrels. : “2 Field Guns of Veteran's Park,” Ohio Outdoor Sculpture Inventory, accessed April 18, 2019, http://oosi.sculpturecenter.org/items/show/1546.